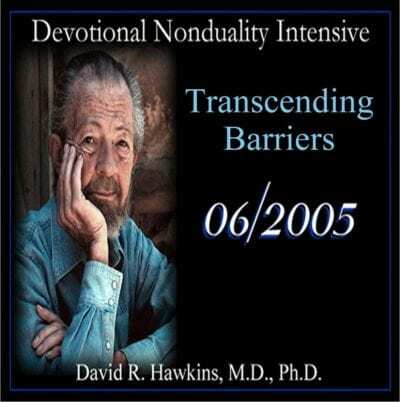 Dr. Hawkins begins “Transcending Barriers” by stating he is presenting spiritual truth within a new context for the modern world in order to validate it. He asks of what relevance to today’s world is what happened 2,000 years ago when people’s lives were quite different from those of today. He shares how consciousness research creates a context that is comprehensible to modern man. 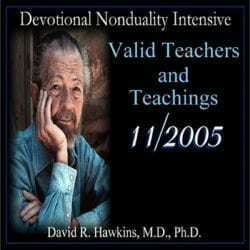 Next, Dr. Hawkins explains where Truth lies, how it is not subject to error, and why it is the Absolute. He reveals that it was mind boggling to discover that everything that ever was, anything from the past or present, can be accessed at this moment in time – all exists completely everywhere all the time. He then presents the concepts of content and context. With this and more, he explains how the book Power vs. Force came into existence. 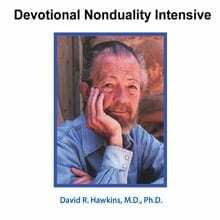 He then describes how consciousness is independent of the body; the differences between near-death and out-of-body experiences; and how Truth appears differently at each level of conscious awareness. He further describes the Map of Consciousness and the characteristics of its various levels. He talks about karma, the “meaning” of something, consequences, and how to use the method of kinesiology to find out what is for one’s highest good in any situation. He explains why the world did not self-destruct eons ago, and why it is not doing so now; why this is a world of maximum karmic opportunity and how we can benefit; and about being responsible for our actions and how to evolve beyond them. He tells us that the animal kingdom is a wonderful example of evolution and why. Dr. Hawkins then discusses spiritual commitment, intention, and their relationship to enlightenment; love versus logic; and the development and existence of an etheric brain. He introduces the concept of the payoff (the “juice”) that keeps us stuck at a certain level of consciousness. The only reason we stick with something negative is due to the “juice,” and our addiction to it. He reveals the way out in detail. We learn how to do an honest self-inventory, and that we do not have to change others, just ourselves, in order to experience the world and people differently. We see how the ego keeps itself alive and why. Dr. Hawkins shares how to bring in the Kundalini energy and what effect it has in our lives. He presents the dualities of Guilt and Hate, how we get stuck in them, and how to work our way out. He discusses the role of fear in our lives, names the basic fears, and teaches us how to surrender them. He emphasizes the process of constant surrendering to God and the benefits that arise from that. Dr. Hawkins also states that God does not intervene unless asked. He then discusses the justice of God; why we procrastinate; the role intention plays in transformation; and the source of devotion. The presentation concludes with questions from the audience that bring further clarification on the subjects presented during the lecture and in the book, Power vs. Force.